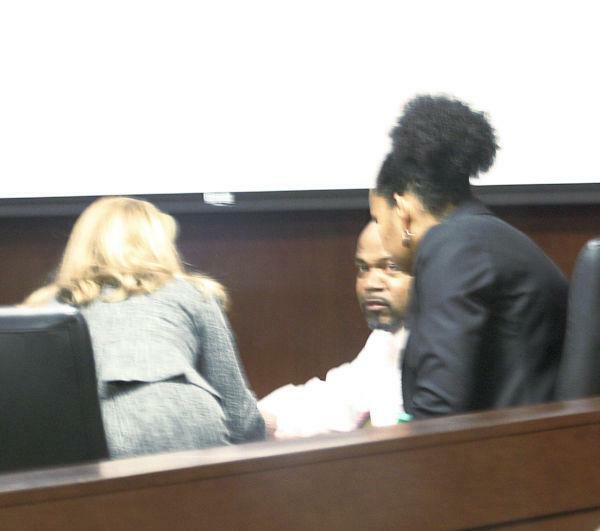 55 year old Derrie Derwin Scott (center) speaks with his Lawyers Lisa Flournoy (left) and Dana Williams shortly before being found guilty of attempted capital murder by a Polk County Jury (03/23/18). 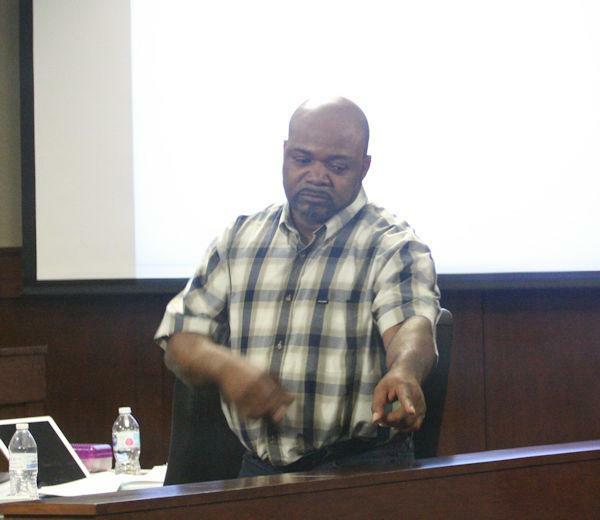 Jury Throws the Book at Derrie Scott; Life in Prison, $10,000 Fine, LIVINGSTON, March 23, 2018 - A Polk County jury has found 55 year old Derrie Derwin Scott of Willis guilty of the first degree felony offense of Attempted Capital Murder of a Police Officer and assessed a maximum sentence of life in prison with a $10,000 fine. The verdicts followed five days of testimony in the 411th District Court and related to an August 23, 2016 shooting incident involving Corrigan Police Officer Austin McCracken following an early morning traffic stop of Scott on U.S. Highway 287, east of downtown Corrigan. Evidence presented by Polk County District Attorney Lee Hon and Assistant D.A. Tommy Coleman established that at approximately 3:20 a.m. on a Tuesday morning, McCracken stopped a 2000 model Jeep Cherokee with paper dealer tags traveling 77 mph eastbound in a 55 mph speed zone. As McCracken approached the vehicle and attempted to identify the driver, Scott exited the driver’s door and began shooting toward McCracken with what was believed to be a .38 caliber revolver. After an exchange of gunfire at close range, Scott managed to flee in his vehicle unharmed. McCracken, likewise, was not struck. A three-week manhunt thereafter ensued involving multiple law enforcement agencies including the Texas Rangers and United States Marshals. On September 14, 2016, with the assistance of cell phone surveillance, Scott was located living in Willis in a pop up camper and was armed with an AK-47 assault rifle, a 12 gauge sawed off shotgun, and two semi-automatic handguns—all of which were loaded and chambered. Scott was arrested without incident. During trial, prosecutors presented detailed evidence regarding Scott’s connection to the vehicle involved in the shooting which had been later located on wooded property belonging to Scott’s family in eastern Trinity County with multiple bullet holes. The vehicle had been registered multiple times during relevant time periods with temporary dealer tags issued from a used car dealership in Houston which Scott had connections to. At the time of his arrest, Scott was also discovered in possession of clothing and other evidentiary items captured on McCracken’s patrol car and body video cameras at the time of the shooting. Cell tower data analyzed by analysts with the Texas Department of Public Safety Crime Lab also placed Scott in the area of the shooting at relevant times. Shortly after the shooting incident, McCracken positively identified Scott from a DPS photo lineup which had been prepared at the request of Texas Ranger Ryan Clendenen. In his closing argument to the jury at punishment, Hon implored the jury to give Scott “what he asked for” and to do everything it could to protect Polk County police officers. The jury deliberated approximately 50 minutes before returning the maximum sentence allowed by law. Scott will have to serve at least 30 years of the sentence before becoming eligible for parole consideration. After the verdict, Hon extended appreciation to Texas Rangers Ryan Clendenen, Steve Rayburn and Travis Brazell for their exemplary efforts in the investigation of the case, and a special acknowledgement to Austin McCracken, now a Polk County Deputy Sheriff, for his heroic actions under fire and in the line of duty. 55 year old Derrie Derwin Scott, of Lufkin, during a recess this morning (03/20/18) in the 411th District Court where he's standing trial for attempted capital murder. Trial Underway for Man Who Allegedly Shot at Corrigan Police Officer, LIVINGSTON, March 20, 2018 - A 55 year old Lufkin man is being tried for attempted capital murder for the August 2016 incident in Corrigan when Officer Austin McCracken, with Corrigan Police Department initiated a traffic stop on a vehicle for speeding (77 in a 55). The incident occurred shortly after 3 am when Officer McCracken was patrolling on FM-287. Based on video taped evidence (car cam and body cam), McCracken approached the driver Derrie Derwin Scott, of Lufkin. McCracken exhibited politeness and professionalism, never raised his voice, and asked for Scott's driver's license and proof of insurance. Scott stated that it was in the back and got permission to retrieve the license. When Scott exited the vehicle, he raised a revolver and began firing at McCracken. McCracken returned fire. Amazingly, neither were struck. Scott jumped in his vehicle (older model Jeep Cherokee) and made a U-turn and sped towards McCracken. McCracken moved to the opposite side of his vehicle for cover as Scott's vehicle side swiped McCracken's patrol unit. Ultimately, Scott got away after McCracken briefly pursued and then pulled off. With what appears to be extremely damning evidence for Scott, his lawyer, Dana Williams decided to attack McCracken's character by referencing an unrelated write up that occurred a year later. If found guilty, Scott is facing from 5 to 99 years in prison for attempted capital murder.